Fig. 1. 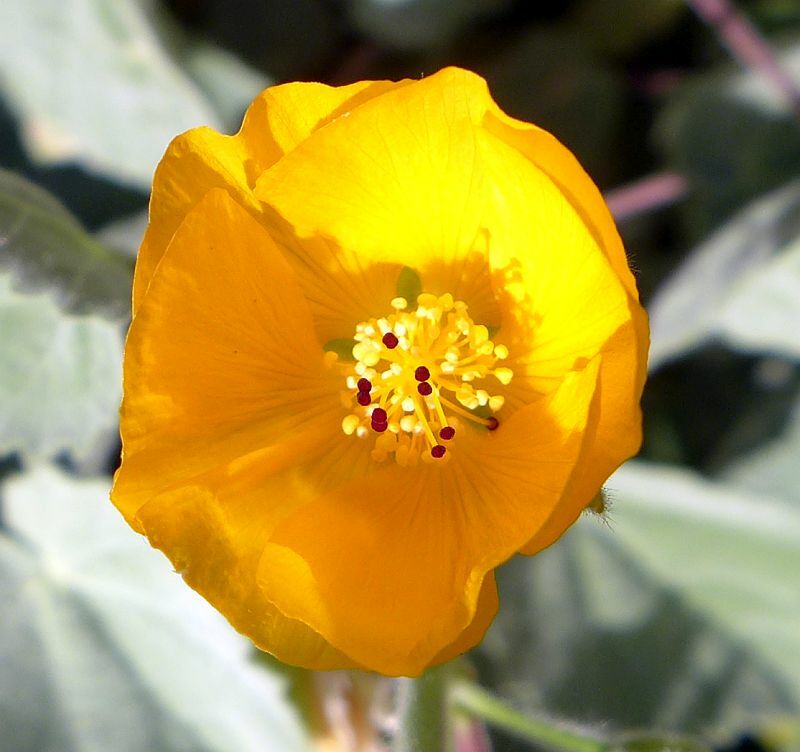 Photographs of Abutilon palmeri from the hills on the west side of The Potrero, taken on 1 April 2019, late in the day. These plants were found by Walt Fidler on 26 March 2019, 78 years after the last voucher of them was collected. Abutilon palmeri is a very handsome largish shrub, three to eight feet (0.9 to 2.4 m) tall and three to five feet (0.9 to 1.5 m) wide, often planted in gardens where it can bloom and look showy throughout much of the year. Other common names for this species are superstition mallow and Palmer's Indian mallow. Fig. 2. Voucher distribution of Abutilon palmeri from SEINet. All locations in California except one are planted specimens.. Whether this species was still present in San Diego County was a mystery until Walt Fidler relocated it on 26 March 2019. Prior to Walt's find, this species had only been collected from the wild in San Diego County twice, on 6 April 1939, by Charles F. Harbison, from "Between Shaw and Potrero Canyons, Desert slope, Laguna Mts. ", and on 30 April 1941, by Frank Gander, from "near base of hills south of Vallecito Stage Station". No one had vouchered or recorded any plants of this species in this area for 78 years, and it was not for lack of trying to find them. In trying to relocate these plants, the first question is where exactly are the "hills south of Vallecito Stage Station". The fairly obvious answer seemed to be the hills that are 0.3 to 1.6 miles south of the Vallecito Stage Station (see Fig. 3). But six searches for it in those hills not only did not find any Abutilon, they found no plants in the Malvaceae family there at all. Furthermore, the habitat of those hills does not seem suitable for A. palmeri. Specifically, Tom and his colleagues have looked for this species in those hills twice, on 17 February 2012 and 15 February 2018. We covered those hills pretty thoroughly, and saw no trace of the Abutilon. Fred Melgert and Carla Hoegen searched for it on 16 January 2016; 28 February 2019; and on 7 and 18 March 2019. Tom's group, and Fred and Carla, have also done five surveys in The Potrero area, without finding the Abutilon. See Flora of The Potrero. Hence it seemed that this species was possibly just a waif in this area, perhaps introduced by travelers from Arizona along the Stage Coach Route. 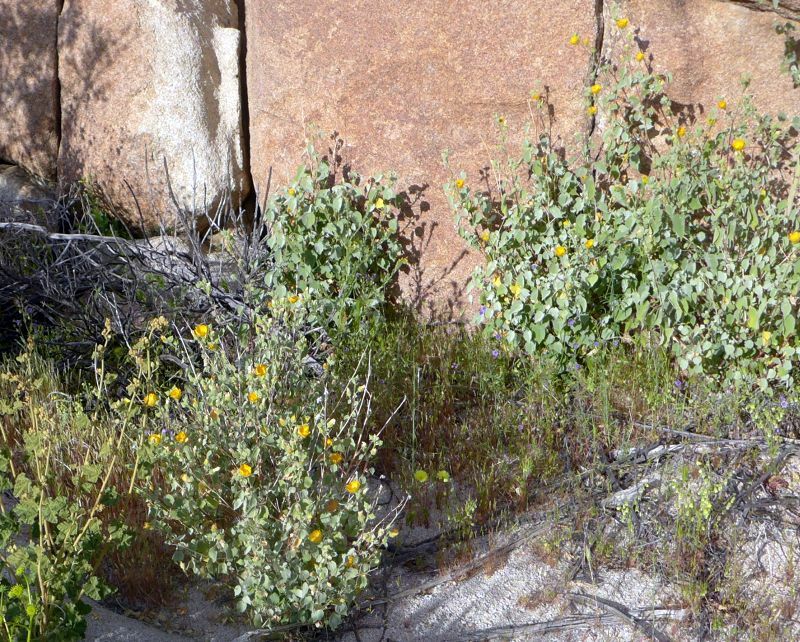 But then Walt Fidler, in his explorations of The Potrero on 26 March 2019, discovered a population of 129 plants at the base of the hills 3.7 miles southwest of the Stage Station!! 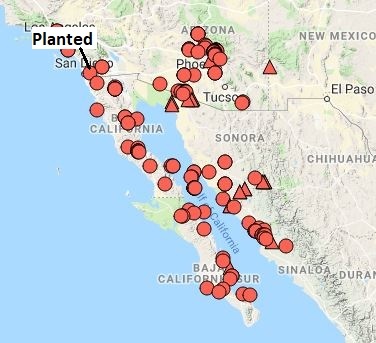 Seeing how abundant the plant was here, in a habitat some distance from the Stage Station, made it clear it had very likely always been here, and this was the northwestern outpost of it from its main population to the south in Mexico and east in Arizona. The plants here are growing in exactly its habitat in the rest of its range: "Well-drained rocky slopes; 300-900 m (1000-3000 ft)". The following maps and photographs show where Walt found it, and some of the plants. The maps use GPS points from Walt, and from Fred and Carla. Walt took 55 GPS points to map the population as he counted it. He would have taken more, but his GPS memory became full. Fred and Carla have posted 70 observations with GPS points, with many photographs, at iNat. Tom took eight GPS points, but they are almost surely all redundant to the others. Fig. 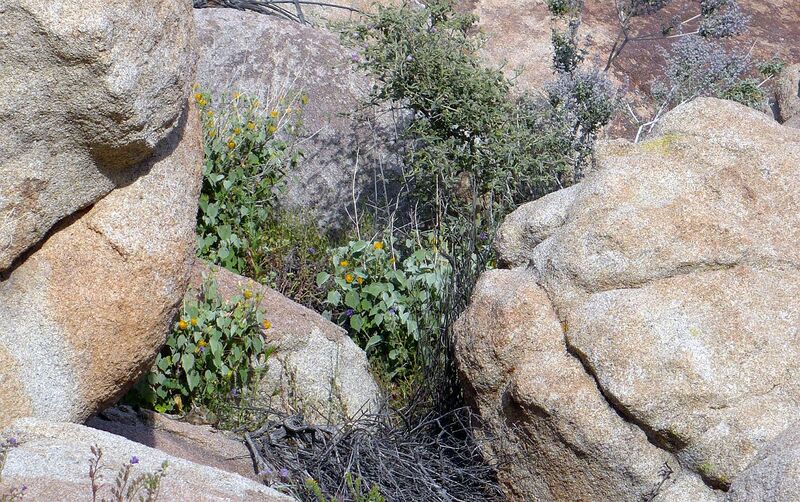 3 shows where the plants were found, in relationship to the Vallecito Stage Station. Fig. 3. A Google Earth view, with north to the top, of the Abutilon palmeri locations, along with some landmarks in the area. Fig. 4 shows a closer view of the terrain in which they live, from Google Earth. The habitat of bouldery slope is evident. Fig. 4. A closer Google Earth view showing the terrain in which the Abutilon palmeri lives. Click on the image for a larger version. Fig. 5 shows a topo map view of where they live, along with survey routes Tom and colleagues have done in this area. 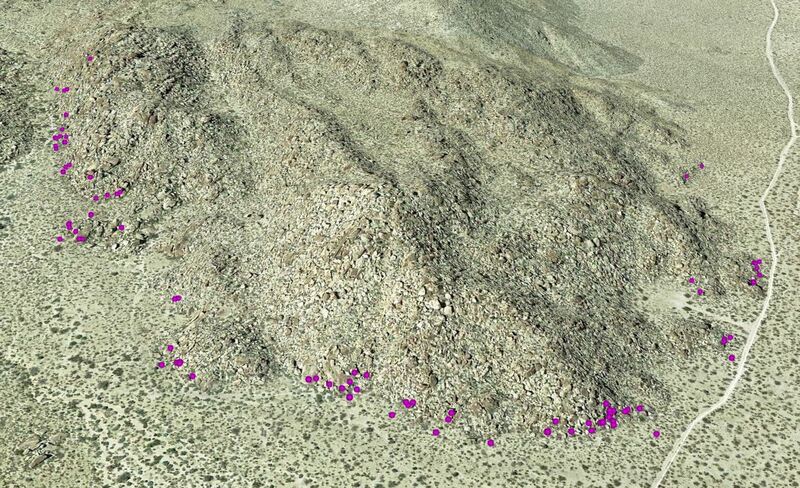 There were no A. palmeri found in those survey routes except for the plotted points. Fig. 5. A topo map view of the Abutilon palmeri locations, along with survey routes Tom and colleagues have done in this area (dotted and solid lines). Fig. 6 shows a panoramic set of photographs from the northwest location of these plants, and Fig. 7 shows a zoomed portion from that panorama showing some flowering Abutilon. Fig. 6. A panoramic view, from four photographs, showing the northwestern Abutilon palmeri habitat. The rectangle shows the area of the photograph in Fig. 6. Click on the photograph for a larger version. Fig. 7. A zoomed view from one of the photographs of the panoramic view shown in Fig. 5. Click on the photograph for a larger version. Fig. 8 shows a panoramic set of photographs from the southern location of these plants. Fig. 8. A panoramic view, from five photographs, showing the southern Abutilon palmeri habitat. Note the people at right in the photograph for scale (Don Rideout on the left; Walt Fidler on the right). Click on the photograph for a larger version. Copyright © 2019 by Tom Chester, Walt Fidler, Fred Melgert, and Carla Hoegen.